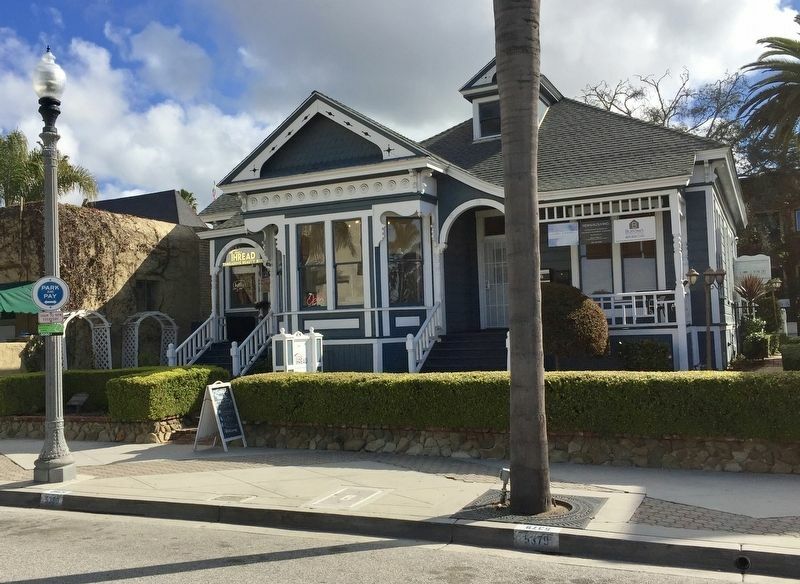 This structure was the office and home of Dr. Thomas E. Cunane who established his practice in Ventura in 1899. The home was built in 1884 and is one of the few remaining examples of Queen Anne cottage architecture which was popular during that time. The house was restored in 1981 by Richard King and Paul Jordan. Location. 34° 16.746′ N, 119° 17.577′ W. Marker is in Ventura, California, in Ventura County. Marker is on South California Streeet north of East Thompson Boulevard, on the right when traveling north. Touch for map. Marker is in this post office area: Ventura CA 93001, United States of America. Touch for directions. The marker is visible here, low to the ground and amongst the bushes, behind the lamppost on the left. (about 700 feet away); Jack Rose (about 700 feet away); 682 East Thompson Boulevard (approx. 0.2 miles away); Chumash Hutash Fiesta (approx. 0.2 miles away). Touch for a list and map of all markers in Ventura. More. 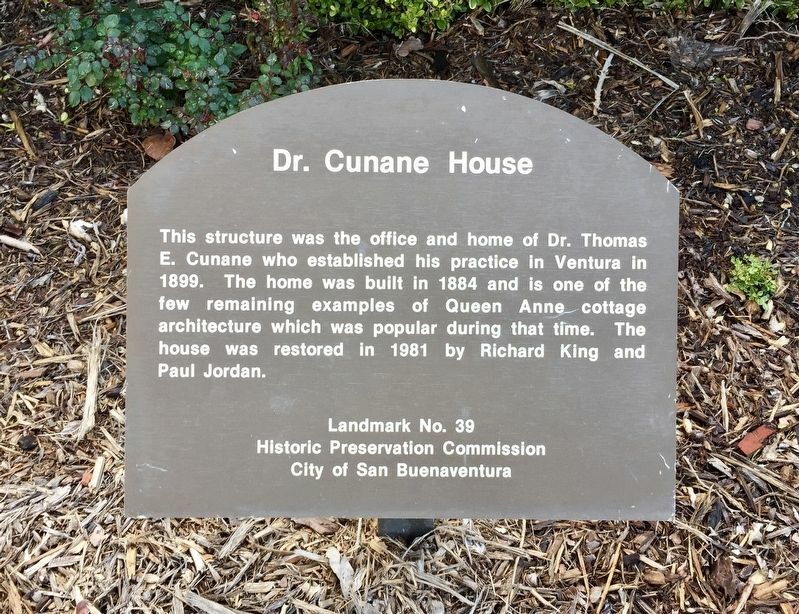 Search the internet for Dr. Cunane House. Credits. This page was last revised on March 18, 2019. This page originally submitted on March 18, 2019, by Andrew Ruppenstein of Sacramento, California. This page has been viewed 108 times since then. Photos: 1, 2. submitted on March 18, 2019, by Andrew Ruppenstein of Sacramento, California.